Reports suggest that the third season will be most likely the last season for the supernatural series. 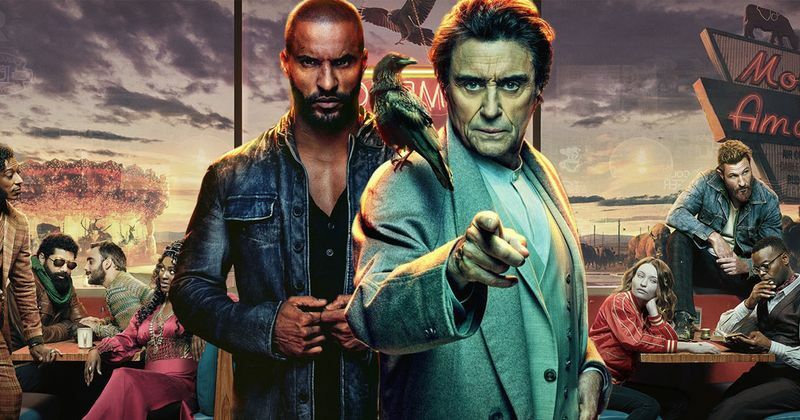 Last month, 'American Gods' kicked off its second season but Starz has already gone ahead and made it official, announcing that a third season of the Neil Gaiman adaptation has just been greenlit, reported DigitalSpy. Despite the scathing reviews, the third season is happening but it is most likely going to be the final season of the franchise. Along with this, the show has also revealed that there is going to be a new showrunner. According to a report published by Variety, American Gods’ new showrunner, who will also serve as executive producer, is Charles Eglee and he has previously worked on shows like 'Hemlock Grove', 'The Walking Dead', and 'Dexter'. And for people who want to know, Eglee will replace season two’s Jesse Alexander, who in turn replaced season one’s Bryan Fuller and Michael Green. Regarding the next instalment of the show, Gaiman is pretty excited, saying, "Chic is the best partner-in-crime. We’ve been working for weeks now on the shape of the season and I’m delighted that he gets to carry the American Gods torch on to glory.” While speaking to Entertainment Weekly, he also added that he thinks that there is a gap between season two and three as it is going to be better managed. 1. American Gods season 3 air date: When will it be on? The first season aired back in April 2017 and after a long wait, the fans got to see season 2 in March 2019. As all the problems associated with the delay have finally been solved, the fans expect season 3 to be launched on a more normal broadcast schedule. The third season is expected to launch closer to summer than spring, with the air date timeline shifting to June, July or later. 2. American Gods season 3 cast: Who will be in it? The cast that is confirmed to come back is Ricky Whittle as Shadow Moon, Ian McShane as Mr Wednesday, Emily Browning as Laura Moon, Crispin Glover as Mr World and Bruce Langley as the Technical Boy. Thinking that all these characters are going to survive through season 2, fans will also hope seeing more from Yetide Badaki as Bilquis, Pablo Schreiber as Mad Sweeney, Orlando Jones as Mr Nancy, Mousa Kraish as The Jinn, Omid Abtahi as Salim and Demore Barnes as Mr Ibis. All these actors stayed by the show during its difficult times. Hence, no matter what happens in the books, they are expected to carry on on the series. 3. American Gods season 3 plot: What’s it about? Even though the series has been a fairly brilliant adaptation of Neil Gaiman’s book of the same name, American Gods the TV show has made so many changes it’s actually hard to predict what’ll happen next. According to one of the stars in the series, Ricky Whittle said, "I feel that now the show is really becoming its own thing it's evolving into a different organism. There's certain threads on the show, that I call 'the Marty McFly timeline' – Sweeney and Laura never meet in the book. And now that they're tight [on TV], there's certain things in the book that can't happen. here's so many different kinds of directions that the show can go in. We can even bring in [Gaiman's 2005 book] Anansi Boys and [2007's] The Monarch of the Glen and all these other spin-off stories that Neil writes, and the eventual sequel." 3. When will the trailer launch? A teaser is expected to drop at San Diego Comic-Con in July, with a longer look at New York Comic-Con in October. The comic-con circle is a very important circuit and it is also hugely important to this show, so the fans expect to see footage sooner rather than later.